I walked into the living room the other night to find my wife with a Wavebird in her hand, running Link along Outset Island's sandy shoreline. "Wind Waker " I said, surprised. "I'm feeling nostalgic," she replied, as Link headed inland to collect rupees from cut grass. I sat down beside her on the couch, also feeling nostalgic. I played through Wind Waker in 2004. It was the first game I finished on my GameCube, which was the first console I'd owned since the Intellivision. Wind Waker was also my first Legend of Zelda game, and the first game I ever played with my daughter. My wife adored it, and soon after I finished it, she also played it to completion. I know now that for many Zelda fans, Wind Waker didn't measure up to Ocarina of Time. I'm also well aware of the controversy over its cel-shaded graphics. As a relative newcomer to console gaming, I didn't have these hangups. I didn't even mind the lengthy hunt for Triforce shards that drew out the latter third of the game. I was completely enraptured by Wind Waker. It was a watershed event in my gaming experience. As I watched my wife work her way through Wind Waker's introductory scenes last week, I couldn't help but note how beautiful it still was. With the exception of some subtle aliasing, it hardly looked dated. The cartoonish aesthetic is as charming and unique now as it was then, and the animation easily rivals that of any game I've played in the past year. Is it presumptuous to deem a game "timeless" only six years from its initial release? Probably. But Wind Waker still strikes me as a game whose beauty and depth will be readily apparent decades from now. Unfortunately, I can't say the same for Ocarina of Time. Ocarina of Time is arguably more epic, sophisticated, and polished than Wind Waker. But Ocarina isn't as visually stunning in today's graphical climate. Its mushy textures and sharp-edged polygons are hard on the eyes. And for that reason alone, Ocarina's better qualities are more difficult to recognize. You have to get past the dated visuals before you can appreciate its genius, and that's a hurdle I fear gamers will have an increasingly difficult time clearing as the years pass. Twenty years from now, which games will we still consider beautiful? Which will still grab our attention? 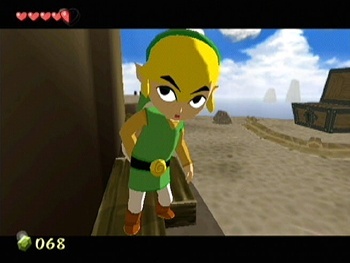 Wind Waker might, because it didn't try to accomplish more than it could with available hardware. Instead of aiming for realism, its creators focused on crafting a unique style, and then applying that style with care and consistency. Wind Waker made full use of the GameCube's abilities, but its technical proficiency isn't nearly as relevant now as its artistic accomplishments.